Here in my little Texas town, we are having a very rainy day, so I thought I would make a cheerful card for you today. I am playing along with Make It Monday #168 at PaperTrey Ink's blog. Ashley Cannon Newell has a video on baby wipe stamping today, so I thought I would give it a try too. You can see the video right here. After I made my umbrella, I decided my card needed to be more cheery than rainy, so it became a shaker card with bright sequins. I just couldn't resist!! You have all week to play along too, so be sure to click here for the link to upload YOUR fun card. Love this Susie! My mother has an umbrella that looks just like this one! What a fabulous shaker card! Hope you see sun soon,we could use the rain. Really cute card Susie. How did you do your umbrella? Did you use markers to make small dots? I really like the card and it is cheery. Beautiful umbrella, Susie! 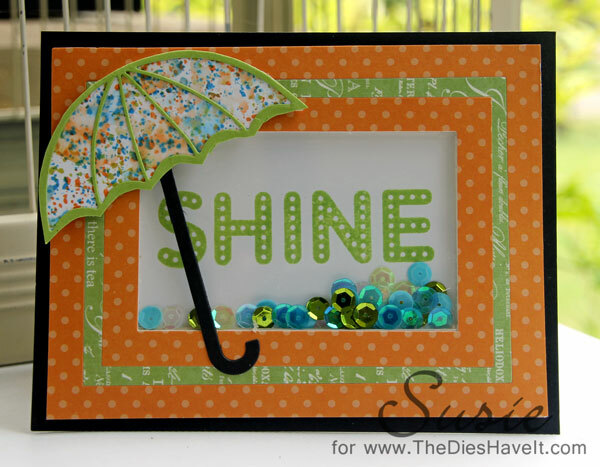 This is a fun shaker card and sure to brighten up any rainy day. That umbrella is so FUN!! I love the shaker card and how you matted it on black card stock. Great job with the technique. Doesn't get much 'cheerier ' than this! Gorgeous fun colors together! Very interesting card! I love you umbrella background and your shaker card to cheer things up! (am curious who make that umbrella die - like the outline design). Very nice take on the challenge. Such a sweet card. I have yet to master a shaker card probably cause I have only tried it once. Very cute. What an absolutely brilliant idea to turn it into a shaker card! I love it! And your umbrella is very fun too! Susie, I love your shaker card. The umbrella is adorable. Great job. What a fun and cheerful card... not "rainy" at all! I love the colors of the sequins inside your shaker. So fun!! Absolutely fabulous! Loving all your shaker cards!